Festive holiday decorations are a great way to show your seasonal cheer, but no one likes the damage many of them leave behind. 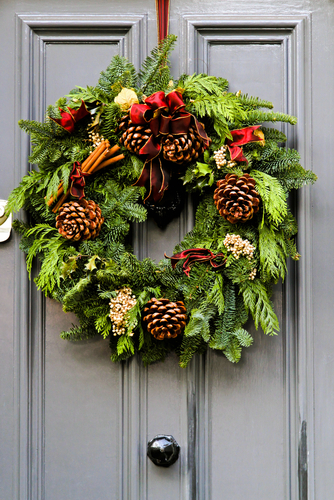 This year, prevent damage to your home, and make the post-holiday cleanup a breeze. Blue Springs Siding & Windows gives you three damage-free decorating tips for the holiday season. Never hammer a nail into your siding to hang decorations. That can greatly damage the exterior of your home. Instead, use something you already have at home. Unfold a paperclip a small amount and slip the hook into the small vent holes on the underside of the vinyl. These holes are very small and can only be seen by looking up under the vinyl siding strips. Use two to four paper clips per decoration as needed. Heavier decorations will need more paper clips. No need to get the staple gun out this year. There are more efficient, and less damaging, ways to hang your holiday lights from your roof. While they are technically office supplies, binder clips are actually perfect hanging devices for your lights. They are the right size to hold your lights in place, and they are also sturdy enough to keep lights in place all season long. The best part is that it takes very little time to hang your lights, and it’s also a quick cleanup with this technique. Keep your new front door looking like new and skip the hammer and nail. Instead, opt for new non-damaging 3M removable hooks. To keep them from coming loose due to the cold temperatures, hang one upside down from the inside of your door, and then tie a ribbon around your wreath, and hang it over the top of the door, so the other loop of the ribbon is held up by the upside down hook. Forget the sticky tape and glue gun. This year, hang holiday garland or lights from your porch railing without damaging the paint or wood finish on your porch (or inside) railing. Use clear zip ties to secure your decorations. Call Blue Springs Siding & Windows today at (816) 228-5225 to help you get your home’s windows, doors, and siding ready for the holidays.